Customer Service Leader or Laggard? 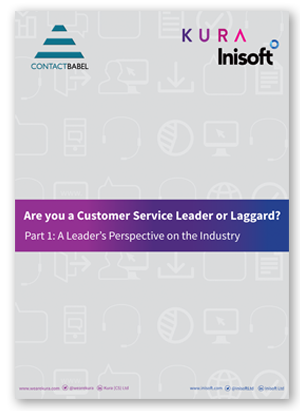 Are you a Customer Service Leader or Laggard? This White Paper is based upon the results of a survey by ContactBabel to over 100 UK contact centre decision-makers, carried out in the summer 2017. Job titles included contact centre directors and managers, CX directors and other senior customer contact decision-makers. The white paper examines the current state of the contact centre industry, from a leader’s perspective. •	71% of contact centre leaders’ believe their advisors enjoy “good” or “very good” morale. •	The number one factor leaders’ believe will boost advisor morale is a higher salary – interestingly though, they do not believe this will improve their performance. •	The top criteria leaders’ are taking to support their front-line advisors is an investment in new technology. Download your complimentary copy of this report now.